Barbarella is marked by the same audacity and originality, fantasy, humor, beauty and horror, cruelty and eroticism that make comic books such a favorite. 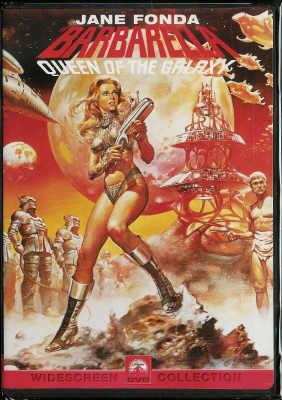 The setting is the planet Lythion in the year 40,000, when Barbarella makes a forced landing while traveling through space. She acts like a female James Bond, vanquishing evil in the forms of robots and monsters. She also rewards, in an uninhibited manner, the handsome men who assist her in the adventure. Whether she is wrestling with Black Guards, the evil Queen, or the Angel Pygar, she just can't seem to avoid losing at least part of her skin-tight space suit!